François Payard, a third-generation French pastry chef, has created what he calls the Macaronut. 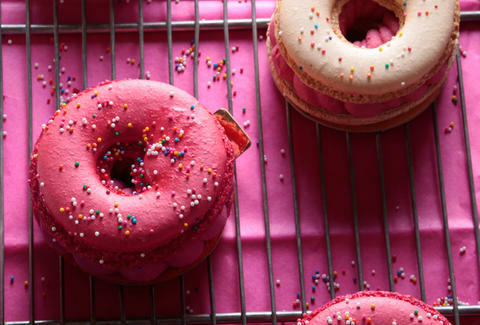 As the name suggests, the colorful new pastry is a mashup of a macaron and a donut, and Payard will introduce them to world at his NYC patisseries on March 20th, which is fittingly Macaron Day. Macarons are delicious and donuts are reliably great, but these things bring together the best of both and come filled with a strawberries and cream ganache. So far, Payard plans to launch with the one strawberries and cream flavor, but depending on how popular it is, he could create additional flavors, according to a report by Mashable. We don't want to pretend to see the future or anything, but something tells us there'll be all sorts of Macaronuts in no time. Tony Merevick is Cities News Editor at Thrillist and wants one with chocolate. Send news tips to news@thrillist.com and follow him on Twitter @tonymerevick.